Mobile chat and photo sharing apps have seen tremendous growth in the last few years and they’re expected to continue this trend throughout 2014. In fact, surveys indicate that people -- and particularly the important teenager demographic -- are becoming less active on social networks and more active on messaging apps. No wonder Viber was just acquired for $900 million and Facebook tried to buy Snapchat for a cool $3 billion. 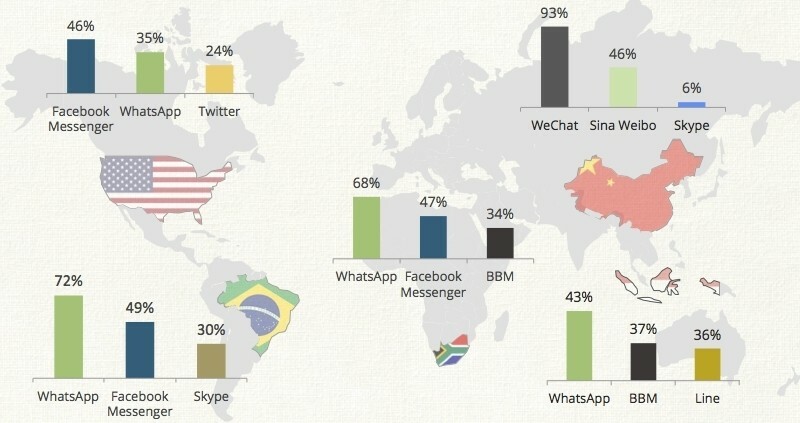 Even though overall WhatsApp has taken the lead for monthly active users, the mobile messaging app landscape continues to be highly fragmented, with different services doing well in different global regions. What's your favorite mobile messaging app? Pick up to three options and comment below on why you prefer one service or the other. I’m mostly a WhatsApp user as pretty much all of my contacts are there and can’t be bothered to try alternatives. I also use iMessage and ocassionaly FB Messenger for people who aren’t on my address book. I’ve tried Line (too bloated for my taste), MessageMe (got messages from random strangers), Hangouts (meh), and Viber (okay but few of my contacts use it). Now I’m trying Telegram which seems more focused on security, has an open API and desktop clients, but only three of my contacts have it and one is married to me.